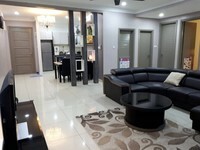 Cheras Heights is a Freehold Condominium located at Jalan 17/144A, Taman Bukit Cheras, 56000 Cheras, Selangor. It is developed by Sycal Properties and was completed in 2012. 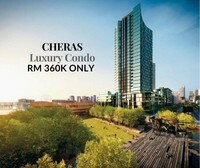 Cheras Heights comes with 1 blocks of 17 storey building which comprises a total 300 units. The built-up size of the unit measures approximately 1,394 – 2,823 sf in size which includes 4 bedrooms and 5 bedrooms. Cheras Heights provides facilities such as swimming pool, wading pool, jacuzzi, playground, multi-purpose hall, gymnasium, barbecue area, laundrette, cafe, mini market, landscaped gardens and 24-hour security. Cheras Heights is near to amenities such as shopping mall (Leisure Mall, Tesco, Giant and Phoenix Plaza), colleges (UCSI University) and schools (SK Alam Damai, SK Bandar Tun Hussein Onn, Sekolah Seri Anggerik Cheras, SMK Taman Connaught, SJKC Taman Connaught and Sri Sempurna Private School.). The condo is easily accessible via Jalan Cheras, the Middle Ring Road 2, the East-West Link highway, the Cheras-Kajang highway and the Kesas highway. Get me good deal if there is any units available in Cheras Heights.